This month my sewing is going to revolve around lace. I’ve never worked with lace before (well, unless you count the racy lacy undies or the Christening gown I made for my niece, neither of which I think really exemplify what it means to work with lace), so you might be asking why now? Two words: MSN challenge. Actually, I guess that’s one word and one acronym. But, anyway, those ladies threw out the idea of us all sewing together with a unified theme, and after much hemming and hawing, that theme became lace. I’m going to do my best, but I’d love to hear from you – what are your secrets for working with lace? If you have tips and tricks to share or good books or resources on the subject, do share. Or, if you have questions of your own, let me know. I’m considering a lace project at the moment so I’m curious as to what you learn! I don’t have any advice, or questions, because I’ve been too boring to sew with lace as yet. I did buy enough stretch lace for a camisole recently, though, so I look forward to see what you end up doing! I’ve sewn with lace. I made a lace Pendrell and an eyelet lace capelet. I don’t have much advice except I loved working with it. Nothing beats the look, in my opinion. Enjoy! Orange is my new colour obsession! 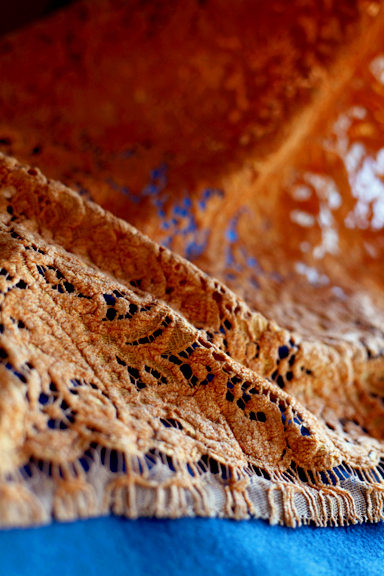 Orange is such a wonderful colour – I am looking forward to seeing what you do with this lace. Can’t wait to see what you make. I know you’ll do that lace proud! You can find lace yardage on Etsy from various sellers. Do a search for lace yardage and see what comes up. Also, I purchased some nice lace fabrics from fabric.com. Looking forward to seeing your progress. I just purchased some orange lace from fabric.com and have been hesitating to begin on it. Maybe that is my intuition telling me I need to go slow with lace. I’ve never sewed with lace except to add it to a jacket or shirt as embellishment. Ooo lovely orange lace! It’s going to be gorgeous! Can’t wait! I love lace and orange is my favorite color! I took a lace class with Susan Khaljie at Mood in the fall and she is wonderful – in addition to her Bridal Couture book, she did an article for Threads on working with lace in the last year or two that you might want to check out. I used grey lace for a Cambie and paired it with green satin underneath. That looked great! So, I’m dying to see with what color you come up. I still haven’t used lace, but it is something I really want to try my hand it. The end results always look so pretty. Can’t wait to see what you do! Good luck, I haven’t used lace either, yet. But, I hear it can be a handful.. Can’t wait to see how you tame it.